With the holidays and a new year approaching, it seems the main topic of conversation these days is where you’ll be wintering. While I’ve escaped to Australia to soak up an endless summer, many of my friends are off to locales just as exotic, but much closer to home. Sure, there’s always over-the-top and over-the-water beach bungalows lining coasts across the Caribbean, but the trend seems to be leaning toward one buzz word lately: privacy. From private villas to plunge pools, planes and personal yachts, privacy is key to upping the exclusivity factor. Why join the crowds heading to ski resorts and crowded coastlines when you could spend the holidays indulging in the ultimate new year’s reset on your own private island? As with most things, Sir Richard Branson had the right idea when he bought the 74-acre Necker Island in the British Virgin Islands. After a fire burnt down the eight-room Great House five years ago, the Virgin Group founder spent two years rebuilding his home before reopening it to the public. Of course you can just book one of the guest rooms sitting on the highest point of the island, but an even better option is to rent out the entire place—temple homes included. Having an island to yourself is one perk, but this one also comes fully staffed with everything from bartenders serving rooftop cocktails at sunset to a watersports team getting you set up to go kayaking, kite surfing or sailing. The island has played host to its fair share of events, but you can also throw your own, from soirees by the sea to glow stick-themed dance parties. COMO Parrot Cay, meanwhile, sits 575 miles southeast of Miami on one of the 40 smaller cays in the Turks and Caicos and requires three modes of transportation to reach it, starting with a flight to the island of Providenciales and ending with a 35-minute boat transfer. The thousand-acre island is everything you’d expect a private one to be with zero light pollution, 350 days of sunshine per year, climate described as “perpetual June,” and mile-long, white-sandy stretches of beach just steps away from waterfront villas (private pool included). Oh, and if you thought you’d have to take care of anything yourself, not the case. Just ring your personal butler any time of the day (or night). 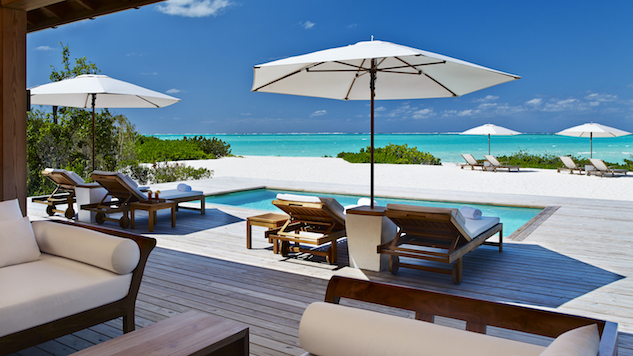 The Shambhala Retreat is not only known for its exclusive locale (even designer Donna Karan owned a sanctuary here), it’s also considered one of the ultimate holistic escapes with Asian-inspired treatments performed in open-air, low-lying pavilions looking out across the North Caicos Channel. Yoga classes are part of the daily itinerary, but for 2017 the resort is making this practice the main focus of the stay with a week-long retreat (and raw ingredient-filled menu) led by traveling yogis, The Curry Sisters. Set to debut in January, Miavana, which means “reconcile” in local Malagasy, makes the island of Nosy Ankao seem like it’s all yours before you even land. You’ll be helicoptered from Madagascar over to the luxury lodge and then driven in a private electric vehicle over to your villa set on the largest of five islands in the archipelago east of the mainland. Home to just 14 villas—all sporting their own swimming pool and deck—the island is yours for the taking, whether you’re into relaxing rounds of spa treatments and yoga or up for something more active like scuba diving, kite surfing or a “blue safari” along the archipelago’s beaches and bays. One of the main attractions here is the preserved natural beauty and wildlife, with plenty of opportunities to connect with nature on your own terms, whether that’s on forest walks or wildlife watching, keeping an eye out for one of the rarest and most endangered types of lemur, the golden-crowned sifaka. French Polynesia makes for such a stunning film backdrop, it’s no surprise stars who’ve filmed here have found excuses to never have to leave. Take Marlon Brando, for one. The star of classics like A Streetcar Named Desire and Last Tango in Paris first visited the Tahitian island of Tetiaroa, 30 miles northeast of Tahiti, while filming Mutiny on the Bounty in the early 60s. Falling for both the island and the film’s leading lady, Tarita, the actor found a way to make the island his own in 1967. In the late-90s, Brando teamed up with developer Richard Bailey to design the first post-carbon resort making for an escape that’s equal parts glam and environmentally friendly so the island looks practically as untouched as when explorers first discovered it 4,000 years ago. Two-year-old The Brando opened up on the 10th anniversary of the actor’s death with 35 thatched-roof villas sprawled across the sand, accessible only by private plane. Pools look out at the sea while second-story bedrooms offer up prime views over the lagoon. Tahitian high chiefs and royalty looked to the island as a space for relaxation and beauty rituals, and the spa kept up with this tradition offering holistic treatments inspired by these ancient Polynesian methods. Spa like the royals with a steam bath ritual of Tahitian black sand body scrub followed by a coconut wrap before treating yourself to a Michelin star-style dinner at Les Mutinés by Guy Martin, serving up a Parisian-inspired menu in a dome-like space that’s surrounded by a moat feeling very much like the lagoon the island sits on.